Malala Yousafzai is a young Pakistani girl who decided at an early age to be an activist for change in her country. As a blogger for BBC Urdu she wrote about her life and the unfair and often inhumane treatment by the Taliban that occupied her country. The one thing that Malala stood for was education and the need for all, especially young women, to be able to receive an education. Malala was shot for her advocacy efforts and fortunately for the world recovered and has become an amazing voice in our world today. She is the youngest person to ever receive the Nobel Prize. When I look at the impact that this young woman has made in her short life I am astonished. She is only just beginning her human rights advocacy and has made such a difference already in her 19 years of life. I can only imagine what the rest of her life will bring. A friend posted a link on her Facebook timeline awhile ago and I knew that I had to jump on board. I have a feeling many of you will as well. 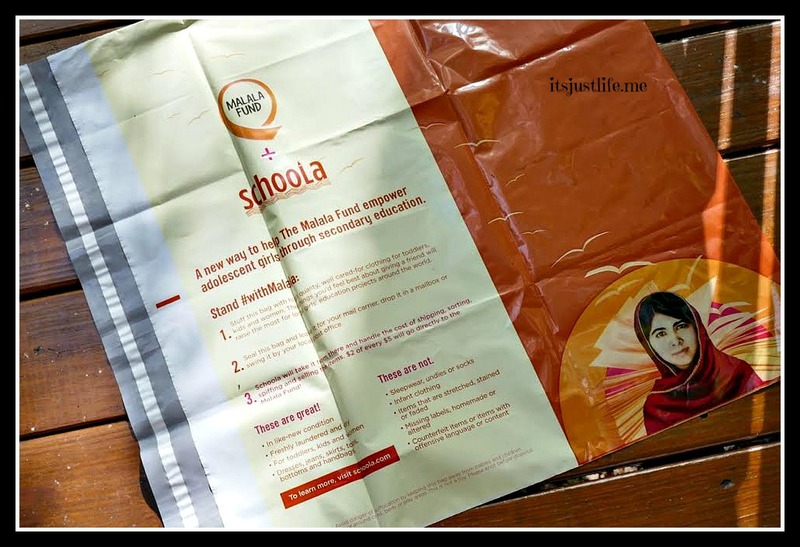 Malala has teamed up with Schoola and clothing donation bags are now available for free for individuals to fill with quality well cared for clothing for toddlers, children and women. The bag comes in a nice little envelope ready to be filled and mailed back at no cost to Schoola where it is then resold through their website to others who are looking for used clothing at a bargain price. 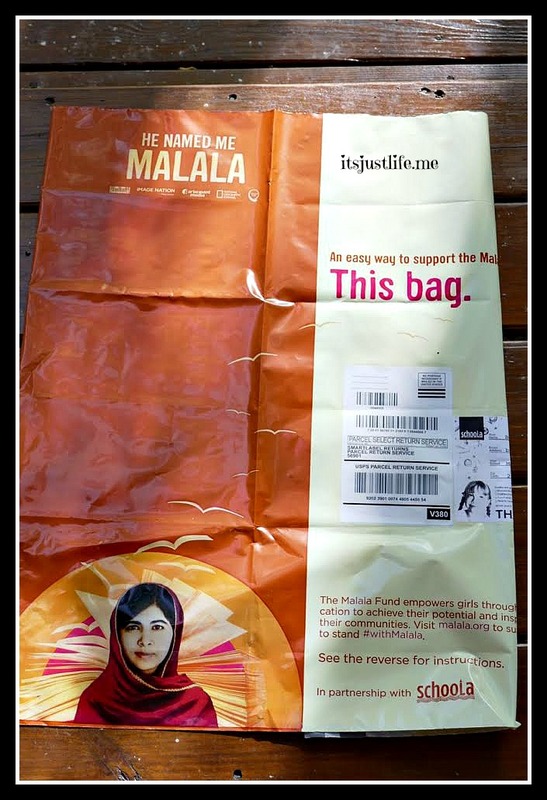 40% of the proceeds (less the cost of inbound shipping) will go directly to Malala Fund to support girls’ education projects in the most vulnerable communities around the world. To me it is a win win situation. Smile knowing you have helped provide education for some young women who have been denied that right. I am doing my part. How about you? It is so easy to make a small difference and requesting a clothing bag here is the first step. For more information about the Malala Fund click here. Stand #withMalala from Schoola on Vimeo. Tell me what you think today in the comments section. Remember every comment means a 50 cent donation to our Comments for a Cause this month – Brevard Music Center. This is a fantastic idea. Thanks for bringing it to our attention. If you get a chance, why not link it to my Feminist Friday column at http://www.HaddonMusings.com so that more people learn about it? Will pop over thereon, Bernadette! Thanks so much for telling me about it and allowing me to share it there. My book club recently read her autobiography and she is amazing. I hadn’t heard of her before she was shot but she was actually already quite famous due to her work on girls’ education in Pakistan. The book is also enlightening about the culture and history of Pakistan. I’m going to share your post with my book club and send for the clothing bag. Yay! I read her book as well quite awhile ago and it is amazing what she has done in her short life. It makes me wonder what the heck I am doing with my life, you know? Thanks for doing your part and sharing your clothes as well with others. I love how easy it is to cause a little ripple this way. Thanks again. Another great cause. Thanks for bringing this to our attention. Hugs! This is very cool and creative. Thanks for sharing how to help them! Another great post, Beth Ann. I’ll have to get her book! And thanks for the link! I, unfortunately just gave away a bunch of clothes, but have just started a new bag so will do this soon! With all the anger and hate I see going on in our world right now, it’s people like this and projects like this that give me hope. Thanks Beth! Malala is a much needed hero in these times. Courage and humility are two of the qualities she possesses that are short in supply. If we all did half of what she’s accomplished the world would be a much, much better place. What a wonderful, easy way to help! Thanks for letting us know! Thank YOU, Cathy, for taking the time to stop by and leave a comment. I appreciate it more than you know. I had never heard of this and will share with others on my social media platforms – thank you for sharing. Thank you so much, Antionette! It is just a little thing that we all can do that can honestly make a huge difference over time. Thanks for sharing. I will fill a bag, it’s a great idea. And I imagine overwhelmingly successful which encourages me to find out more. I wonder how on earth they process all the donations? Malala is nothing short of amazing. I think it would be overwhelming to process it all and hopefully people read the “rules” and send only what they ask for . Malala is such an inspiration. Thanks for stopping by. An amazing young woman. The world needs more like her. I agree. We need to clone her. She is a brave young woman. Thanks for sharing. Thank YOU for stopping by and taking the time to leave a comment. Malala is an inspiration. Thanks, Mandi. She is such an amazing individual who leaves me wondering what the heck I have done with my life when she has done so much already in her short life. She is very inspiring and this project is a very simple way to help a little bit. Thanks for stopping by and taking the time to comment. Love this. Next time I go through my clothes I will do this instead of bringing the bag to Goodwill which is what I usually do. Wish I had seen this earlier. We had soooooo much clothes to give away when we were packing up for our move. I have her book on top of my reading pile. She’s an amazing young woman. I know that there are several bags worth still in my closet. With your girls growing up I bet you could fill a few bags with those as well. And yes–Malala is amazing.